﻿ Four CEOs in Six Years: What Does the Future Hold for Italy’s Leonardo? Four CEOs in Six Years: What Does the Future Hold for Italy’s Leonardo? PARIS --- The nomination of banker Alessandro Profumo as CEO of Italy’s Leonardo on March 18 was greeted with surprise and apprehension by industry observers as well as investors in the diversified group, which is still reeling from a series of events that claimed the heads of five successive chief executives in six years. For the most of this decade, Leonardo – or Finmeccanica, as it was previously known – has been unsure of its role and goals, while top managers spent much of their time fighting off internal challenges or legal troubles, and were thus unable to set and implement an overreaching strategy for the company and its semi-autonomous subsidiaries. At this stage, there are three immediate priorities for the incoming CEO: restore employee morale; choose and implement a clear corporate strategy; and win new business. The three are interlinked, and none can make much progress without the others. Five CEOs in six years is a lot for any company, and worse for Leonardo because each tried to take the company in different directions. 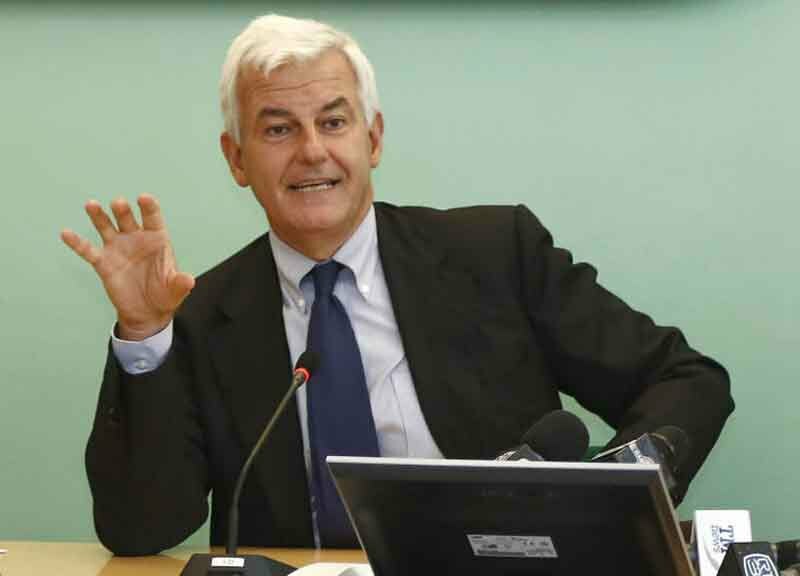 Pier-Francesco Guarguaglini, who was CEO for nine years, was forced out in 2011 after a showdown with Giuseppe Orsi, who had been appointed to the number two position with a clear mandate to clean up the company. The fight for his succession, which Orsi finally won, sparked off a long bout of infighting whose effects are still felt today. Appointed CEO in 2011, Orsi was arrested in early 2013 and prosecuted for having allegedly paid bribes to win a €563 million helicopter contract in India. He has always denied the charges, and his conviction was quashed by Italy’s top court in January. His immediate successor, Alessandro Pansa, Finmeccanica’s long-serving chief financial officer and deputy CEO, took over after Orsi’s arrest, but was himself forced out a year later when the Italian government decided to appoint Moretti in his place. Mauro Moretti, an engineer who had previously spent his entire career in Italy’s state-owned railways, was a surprise appointment in 2014. His contract was not renewed this month after he was sentenced to a seven-year jail term – which he is appealing – over a 2009 railway accident in which 32 people were killed. Brought in as a new broom, Moretti fired much of company’s top staff, replacing them with outsiders having little knowledge of the company, its products or its markets; slashed costs, and absorbed its largely autonomous subsidiaries into a new “one company” to better directly control them. While this plan succeeded in reducing costs and debt, and returned the company to profit, it also reduced the company’s size, slowed its marketing and sales efforts, and cut back on investments. Moreover, this was done with little regard for corporate niceties, and with little or no internal consultations, while decision-making abruptly shifted to corporate HQ in Rome. All this had a disastrous effect on morale. Company insiders say the net effect of these changes is that the company won just one major sale in three years – 28 Eurofighters to Kuwait – but note that it was initiated well before Moretti’s tenure and was largely closed by the Italian government officials. “You can always cut costs, but if this stops you from selling your products you’re going nowhere,” said one. In fact, the company has lost several major competitions in recent years, which many attribute to the limited knowledge and experience of the corporate executives who now manage divisional salesmen from Rome. While Moretti’s firing was not entirely unexpected after his sentencing, the fact that Profumo is a banker is viewed with some suspicion by both investors and employees, especially since Economy Minister Pier Carlo Padoan told Parliament on March 22 that Profumo was appointed because of his “international experience and his ability to manage very complex corporate situations” – two traits which Moretti lacked. As Leonardo reduced debt and returned to profit, its revenues and orders both dropped. Unease about Profumo, and media stories claiming he had been brought in to break up the company and sell off the pieces, caused Leonardo’s share price to dip by 8% in the two days after his nomination, after having climbed 14% the previous week when news of Moretti’s replacement was leaked. Leonardo must also act quickly to reassure its customers. Because of the Indian bribery scandal, the entire group has been black-listed there and cannot even sign contracts for sales it has already won, such as a very large order for torpedoes. And observers note that the company has not done much to pursue Asian markets, despite the fact that regional defense budgets are growing very fast, while those of its traditional markets in Europe and South America are stagnating in comparison. Relations with US customers and partners must also be patched up. While Leonardo has sold C-27J transport aircraft to the US Army, which then passed them on to the US Coast Guard, it broke off its teaming agreement with Raytheon to bid for the US Air Force’s largest competition, the future T-X trainer aircraft. Raytheon apparently found Leonardo’s asking price for its M-346 jet trainer too high, but the decision to instead name DRS Technologies, its US subsidiary, as prime contractor smacks of desperation, and illustrates the company’s inability to find a willing partner despite the excellence of its aircraft, which was sold to Israel and Singapore, two of the world’s most demanding air forces. Leonardo recently teamed with Boeing to offer its AW139 helicopter for the US Air Force’s competition to replace the 84 UH-1Ns operated in support of the ICBM force, but given the two companies’ product range there is little likelihood this relation could be further expanded. Unofficial statements that Profumo had asked to be backed up by a company insider as his deputy went some way to calming the markets, but they – as well as employees and customers – need further reassuring about Leonardo’s future strategy. The ultimate decision, however, rests with the Italian government, which controls the company by virtue of its 32% shareholding. Having nominated Profumo, the government must now decide whether it wants Leonardo to be a competitive, world-class technology group, or whether it simply wants a national defense contractor to support defense programs. The two are mutually exclusive, and require very different levels of investment and political support. Governments in Italy, however, change frequently. Each of the last four CEOs, for example, was appointed by a different government, each with its own policy – or lack thereof - leading to little continuity, and making long-term strategies difficult to implement. The government also needs to decide whether Leonardo should continue to be a diversified main contractor, which designs, develops and produces its own products, or whether it should simply produce and support products made by others. This subcontractor approach led to Italy’s investing nearly one billion euros in a plant to assemble and support Lockheed F-35s for the Italian and other European air forces. But, so far, orders won by Leonardo and other Italian companies has fallen well short of what had been promised, showing the limits and risk of this approach. There also are major decisions to be made about how to market and sell the company’s products, which are largely competitive but which in recent years have not been marketed very effectively, notably because of the upheavals at the top and the lack of clear directives by top executives who do not know the business. Across its major business lines -- helicopters, aircraft, electronics and ground and naval weapons-- Leonardo has a competitive product range, but must now look to their upgrades and, further down the line, to their replacement. This will require considerable investments, but the company must first decide which products are worth replacing and which are not. Its armored vehicles and artillery, for example, have not won many export contracts, and the Italian market is too small to support that business line, so one decision is whether ordnance and armor maker OTO-Melara should be kept, shut down or developed, at a time when a growing number of potential clients (Turkey, South Korea, UAE, to name but three) are developing their own weapons rather than importing them. And, while the need for investments in research and development is clear, there is a possibility that the cash available for this will drop. Company insiders say that management in the past year or so focused on embellishing the financial results for 2016 to secure the renewal of Moretti’s contract, which means the financial situation will likely degrade. If these steps are not implemented fairly quickly, and if the Italian government does not act decisively to support the group and its new CEO, it may well end up having no option but to break up Leonardo, and either selling off its components or turning them into joint ventures with foreign partners.